Even though they are kind of a lot of work to write up, I enjoy sharing my Our $200 Grocery Budget: What I Spent & Saved this Week posts with you all each week. I don’t do these posts because I think the way I shop and live is that amazing, I do them because I love to help people save money. These weekly posts allow me to share ideas and tips with you that help me save on our groceries, and then in turn can hopefully inspire you and give you ideas on ways that you can save too. Many people are frustrated because they feel like it’s impossible to eat healthy on a budget. By showing exactly what I purchase on a tight budget, it gives people a chance to see that yes, you really can eat pretty healthy without needing to go broke. I know many of you enjoy these posts because you have told me that you were inspired or that you learned something new that is helping you save. And seriously, when that happens it totally makes my day because I realize that my goal for these posts was accomplished! But I’ve had a nagging worry ever since I first started doing these weekly What I Spent & Saved posts 5 ½ years ago. Occasionally I’ve addressed it in my weekly posts and in my response to people’s comments. And I’ve said it countless times to readers that I’ve talked to in real life. But I feel like it needs to be said here too, in a blog post that hopefully will be seen by most of you. So what is it that worries me? Simply that these posts will make you feel inadequate or less than because you don’t have a $200 grocery budget, or because you don’t coupon as much as I do, or because you hate grocery shopping. I worry because I know that we as ladies are so quick to do that, to compare ourselves with someone else, to feel inadequate. And I really, really don’t want to be an enabler of that. So I just want to be perfectly clear: I don’t expect everyone else to have a $200/mo. grocery budget. And I believe that you can be frugal and spend more than $200/mo. too! Here’s why. One of my strengths is being able to save money. I’m wired in such a way that I about can’t keep myself from looking at life through the lens of frugality! But you know what? There’s other things that I don’t do so well at. I stink at decorating! And I feel totally overwhelmed if I try to tackle a craft project, because for as long as I can remember, creating things like that has just felt frustrating. And while I love the idea of preserving memories with beautiful scrapbooks, I’ve finally accepted the fact that it’s just not my thing and I don’t even bother to attempt it. I don’t have a garden and I’m not an outdoor sort of person who loves creating beautiful flower beds. Chances are, your strengths are quite different from mine and honestly, I think our diversity is part of what makes the world so interesting! If being frugal doesn’t come naturally for you, that’s okay. No, it doesn’t give you a free pass to spend your money carelessly, but it does mean that how you spend your money is going to look differently than how I spend it. Or maybe you are frugal by nature, but still spend $450/mo. on groceries. You don’t necessarily need to feel bad about that either because…. We eat fairly simply. I think our meals are tasty and filling and the reality is, we enjoy the way we eat a lot. But we pretty much never eat steak (unless we go out to eat!) and meats are often served more as a side than as a main dish. In the winter, we eat a lot of soups not only because we love them, but also because they are frugal. Neither do we have food allergies or eat organic (unless I can get it really inexpensively). Your family’s needs and preferences are going to look different than ours. Your husband might find it really important to have large servings of meat at every meal. Or maybe he feels like soups shouldn’t really even be considered food. You might have a child that is gluten intolerant. And eating only organic may feel super important to you. That is okay! Your family is not mine, my family is not yours. There is no cookie cutter grocery budget that will fit everyone. It’s no secret that shopping frugally takes time. Many weeks I spend three hours planning my shopping trip and doing the shopping. It’s not that my life isn’t busy or that I don’t have plenty of other things to do, but for a variety of reasons, my husband and I have decided to continue to make this way of shopping a priority. At this point, for us the benefits outweigh the negatives. But there may come a time when we decide otherwise. You know your life, your schedule. Only you know what you have time for and it may be that even if you would love to coupon and deal shop, that you simply can’t right now due to life circumstances. We all have to know our limits, to decide what is best for us. Yes, I think it’s important to shop smart and be mindful of how we spend the money that God has trusted us with. But I think it’s equally important to remember that it is going to look differently for everyone. So, if you’ve been feeling badly that you spend more than $200/mo. on your groceries, go ahead and extend yourself some grace. And remember, it doesn’t necessarily mean you aren’t frugal! If you are looking for ways to trim your grocery spending though, check out these posts for some inspiration! This post blows me away for several reasons. It is exactly the type of how-to post that the world needs more of because we can’t all be painted with the broad brush of do-that-and-not-this-all-of-the-time. It’s graceful, but still encouraging. 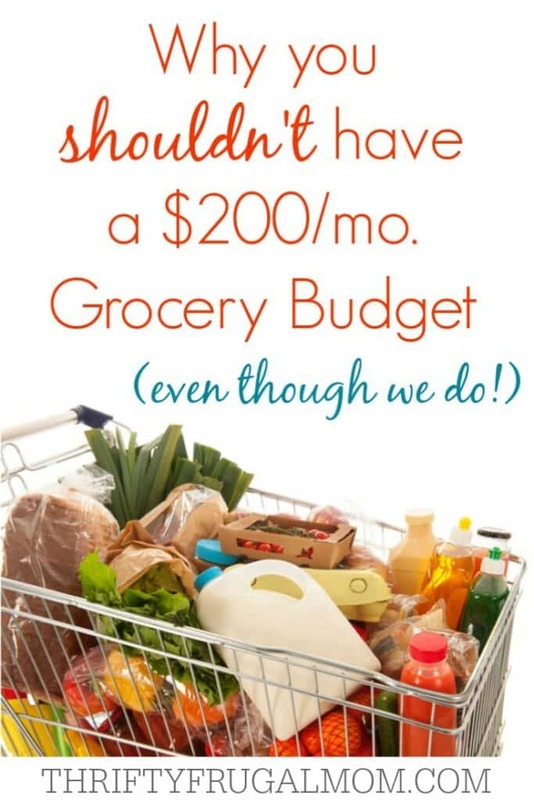 I’ve come to accept that although I like grocery shopping, and I actually enjoy spending time planning my deals, there are many complicating factors that come into play when it comes to our household budget and $200 is kind of just aspirational at this point in time. However, because of the tips you’ve provided on your blog, I get A LOT more now for what I do spend, and we are rarely “all out” of anything important. I love how much you share about your frugal habits, and recognize it must be hard to put yourself out there like that. You are kind as usual, Monica. And I like your “complicating factors” wording. Describes it well! I’ve had readers ask me how much we spend per month on groceries and I couldn’t really tell you. Most of our groceries are bought in the fall, with a little topping-up over the winter. But I doubt we spend more than $2400/year for a family of six. (Medically necessary hypo-allergenic baby formula NOT included) I suspect we eat much like you do. We eat venison (free! ), our own chickens when we cull them, on-sale meat from the grocery store, produce from the garden. Lots of potatoes, which come in 50 pound bags or from our garden. We buy in bulk, we eat a *lot* of soup, and I do a lot of preserving. I don’t decorate, scrap book or have flower gardens, either. :) Around here, I let God take care of the flowers and I enjoy a variety of wild flowers in the fields from spring until fall. And I can’t sew. Marie, that is so inspiring! I love how you grow or raise so much of your own food- cheaper and healthier! And your letting God taking care of the flowers comment made me chuckle. Sounds like my style of landscaping! If I had a family to feed on the same diet I eat, my budget would SURELY be over $200. I feed just myself on $200/mo. I come in under that sometimes but I find my priority is getting the healthier options of things even if they cost a bit more. Before I really started paying attention to ingredients lists, and buying some stuff organic I was able to stick to $150, but that hardly does it for me now. I love how this post addresses our habit of always comparing ourselves to others…such a bad habit to have! I’m constantly trying to remind myself not to do that. Yes, it’s so easy to compare ourselves with others and forget that there are so many variable differences that really, it doesn’t even make sense to do it! This is so true! I would add that family size and the age of your kids is also important. We were able to spend about $200/mo for the four of us when the kids were toddlers. Now that they are nearly teens, they eat a LOT more so it naturally costs more. I enjoy these posts for money-saving ideas. We will never see $200 a month again until my kids move out of the house–lol! So true. My hubby and I have a grocery budget of $400/month (though we do include things like laundry and dish stuff, bathroom essentials and our toothpaste, face wash, etc). But we usually do pretty well with the food itself. I am always trying to find ways to save money. Sounds like you are doing a great job, Heather! When I was a stay-at-home mom, staying under budget was critical. I probably spent 5 hours a week working on it, clipping coupons and shopping sales. Now that I work as a part-time attorney (about 15 hours a week), I’ve cut it down to 3 hours (including shopping time). I don’t save as much, but I need the time now. Your experience shows so well how depending on the stage of life we are in, really working at saving money on groceries may or may not be worth it! Thanks for sharing! Thank you for your empathy. Excited to have you here, Alison! You said, "but there is always room for improvement and your posts can help others find inspiration to keep working at theirs" and that is exactly why I blog about my grocery budget and menus. I totally agree with your points here! I was frustrated with people seeming to tout their "numbers" and others feeling like failures when I wrote "How to Compare and Cut Grocery Costs." http://lettersfromsunnybrook.com/compare-cut-grocery-budget/ There are just so many variables that it is unfair to compare without dissecting everyone's very unique situations. Some eat out several times a week, and others have kids that eat school lunch. Ages of kids is another big impact (mom to a teenage boy here! ), and with that the number of adults in household. We also may define "grocery" or "food" differently. Is everyone just looking at items they eat and drink, or are household items included. What about spices, oils, etc, used in cooking? How many meals and snacks are included per day? It just goes on and on. I, too, like to share my tips and strategies for being frugal and saving. I truly want to encourage and help others, as I see so many feeling overwhelmed. I'm delighted to see that you also take the path of inspiring and encouraging, rather than making others feel bad about their own budgets. I love the heart of this post. I completely agree with you. Comparison can be a deadly trap. We need to learn to accept our differences and extend grace to one another and to ourselves. We are a frugal family, but our current circumstances have us needing to cut back even more drastically. I think I'll be spending a lot of time on your blog looking for anything I might have missed. Thank you! May God continue to fill your cup to overflowing! Yes, a deadly trap indeed! And I'm sorry that you're needing to cut back even more. That is hard! I hope that you will be pleasantly surprised at the ways that God provides for you. Thank you for this!! We have gluten allergies and dairy allergies in our family and we eat mostly clean because of that. Our grocery budget it high and no matter how much I try to get it down it stays around 400 a month with 4 kids. I used to read the $200 a month posts and think that something was wrong with me, and feel like I was some how failing but then I woke up and reality set in and I realized that, like you said, we are all different and we can't all possibly follow the same exact pattern and spending. We are frugal in our spending but with so many allergies our regular items still cost more then normal regular items. I am seriously loving this post!! Thanks for sharing. Wow, from what I know, $400 a month with gluten and dairy allergies is doing really well! And I'm so glad that this post encouraged you....totally made my day, because well, that is why I wrote it in the first place. :) Blessings as you continue to bless and help provide for your family. It sounds like you are doing a great job! It's so hard to compare $$. The cost of living varies so much in different places. Thanks for posting. I'm pretty frugal by nature too. I spend as little as I can on everything, because I feel a sense of accomplishment when I save money. Even though it's usually just two adults that I have to feed, I still probably couldn't do it on $250/month. Our grocery stores don't really do coupons, and since I don't buy processed foods as a general rule, manufacturer's coupons are usually worthless to me. As you've pointed out here, that doesn't make me wrong and you right, and neither of us is inferior to the other. We just have different challenges. I LOVE this! We're a family of four, two of whom are in elementary school and our budget is $480/month (which includes household goods like toiletries, cleaning supplies, etc.) When I see a lot of posts about how people eat so cheaply, especially with bigger families, I definitely compare and feel bad about myself at first. Then I remember a few things: 1. I live in Southern California. The only thing around here that is cheaper than most of the US is produce and even that isn't always true. 2. I don't garden, I have a very black thumb. 3. I don't cook/bake as often as others for certain items. For example, I have made bread and I can if I want to, but I usually don't remember I need to make bread until the kids complain we are out and they can't make pb&j. For me, it's easier to add it to my grocery list and grab a loaf or two at the store. Could I bring my grocery budget down? I'm sure I could, especially if I could remember to do stuff like make bread ahead of time! But it's wonderful to remember that it works for me and as long as we're fed and happy, I shouldn't worry about it. I like your non-snobbery! I found your blog from your post on parents.com and remember some of the comments you mentioned from people who didn't like your attempts at frugality--I have been snobbed by people in real-life for simply mentioning that I'm trying to save on groceries, by the way. I think it's crazy how some are so quick to judge and to assume that spending less means depriving our families. By the way, we do a lot of things the way you do--from scratch cooking, staples and we rarely eat meat and processed foods--in my first pregancy it looked like my daughter was too small and people gave me a serious tongue-lashing to the point where we consulted with a dietician--who told us we eat better than 90% of the population (and we live in France). Cheaper can, in fact, be healthier. Anyway it's nice to see you don't return the judgmental attitude. Here in France, I've noticed read that 'average' grocery budgets are more around 400-700 euros, but I think that translates basically to the USDA data (if you consider the euro to be equivalent to the dollar). I don't think I'll ever get our budget down to 200 a month, but I find your ideas insporing--lots of other sites when I look over the suggestions for saving money I find myself thinking, "yeah, ok, I already do that." What I miss here in France is the lack of places like Costco for say, a year's supply of toilet paper. Also, no cupons here. Just shifty 'promotions' which try to get you to buy three of something for the regular price! My current goal is to get our groceries stable at 4-500 a month (including diapers!!) and then maybe to switch over to organics on some items before going lower. Still, I find your budget inspiring. I even mentioned it to my husband and the fact that you don't eat cheese. . .which can be quite a budget here in France--again for something that is enjoyable, but not really good for you or needed. My husband likes his wine and cheese but saving 2-300 a month also got his attention! Thanks, Trish for your encouragement! Like you I don't get why people are so unkind about someone wanting to save money, but there are plenty that are. And I found it interesting that your dietitian told you that you all ate better than 90% of the population. :) Yes, being frugal with your groceries doesn't have to mean you don't eat well! And I think you are doing amazing for not having coupons and many sales! From the little I know, it's much harder to really save on groceries in the ways that I do if you don't live in the States (or maybe Canada). But I'm so excited to know that you can still read this blog and be inspired and take away helpful tips and ideas. THAT is the whole reason I blog and it just blesses me to know that you are being blessed. Great points! Taking the demands on your time into consideration is a big one. I've started having to ask myself "can I save more money doing this, than I would make if I were spending this time working?" Sometimes, the answer is no. Thanks for sharing with Waste Not Want Not Wednesday! That's a great question, Elise! I know I've definitely gotten choosier with how I save as life got busier with having 3 children and working from home as a blogger. It's just so important to take the whole picture (time and money) into consideration! It is so good to do what we can.... what God gifts us to do.... and to be careful to not compare ourselves to others.... you are so right that we all have different strengths and weaknesses... Saving money is great... and we do a lot of that, but I also realize there are so many factors involved. Yes, totally! The comparison thing can be so easy to fall into and that is just not helpful in any aspect of life, really. You make some great points. I always feel bad that our grocery budget is hanging out somewhere between $400 and $500/month for a family of four. HOWEVER, my husband and I love big breakfasts (pancakes w/ hashbrowns and fruit). My husband will not eat meatless meals and loves his seafood. I'm as frugal as a I can be given our tastes. We like steak, ribs, and lobster. That's just the way it is. Yes, I know you aren't the only people that would find it hard to eat entirely like we do! :) It definitely helps that we both grew up living pretty simply. Blessings to you as you figure out creative ways to make your budget work for you and your family! Thanks for the reminder that in Christ we are all unique with different strengths and weaknesses. I do appreciate that you help people save money. That's a great ministry. Yes, Leslie, I'm a fan of spending money wisely, at the same time, I realize that God created us all with unique gifts and so the way this looks for each person/family is going to be different. I think it's so important to remember that and not play the comparison game! And thanks for your encouragement too. I pray often that this blog could be a blessing to others. thoughtful, insightful and considerate post! keep up the good work! Thank you so much for posting. This brought tears to my eyes because I'm newly married and have high hopes to save money and meal plan, but I've been overwhelmed and have felt like a failure. Every meal I've been stressed about how much it costs. Thank you! I love that fact that your post is so open minded. It sounds like everyone that posted is doing pretty well. I am always trying to cut our budget and eat well. We have two adults and two elementary aged children. What you do is amazing. I read this article about grocery shopping, and from the sounds of it everyone that posted that thinks they are spending a lot really aren't. The article I read from 2009 said that the average costs of feed a family of four a healthy diet could range from $146-$289 a week. I try very hard to keep my month costs under $600, but it is a lot of work. Keep it up. Christine, thanks for linking to that article. What an interesting read! And yes, I think that unless you use coupons and deal shop 99% of the time, it's pretty much impossible to keep your grocery expenses under $500 a month for a family of 4. And even that number, as you mention, is difficult to do. Food prices keep rising as well, so I think it's only going to get more difficult to keep our grocery budgets low. That's part of the reason I thought it necessary to write this post. And I appreciate you adding your thoughts and the article link to help people get more perspective. Blessings! Thanks for posting this! I was starting to feel overwhelmed at the prospect of meal planning more frugally and I'm really glad that you wrote this blog post. At first I thought I was doing great thinking...I usually spend less than $200... then I read that is per MONTH not per WEEK :) A lot of our budget goes to fresh, organic local food which can get pricey. But, we cut a lot out in other areas and to us, it's worth it. Thanks so much for the great article! Thanks for this Lydia! I’ve been budgeting for a few years now and since we’re married I’ve been trying to cut down on my groceries. This month I cut back another $100 and have found it doable but I’m afraid it’s still more than your $200 a month! I was getting a little frustrated that I can’t get it down to $20 but as my husband pointed out, we do eat different due to my food intolerances. So it’s good to be reminded that as long as I do my best it’s ok.:) also, your Aldi post helped me out, I do nearly all of my shopping there and it’s good to know I’m not imagining it when I think I’m saving by doing so even if I’m not using coupons. I do enjoy the challenge of seeing how little I can spend and how much we can save and pay off each month. Except for occasional times when I’m sick of counting every penny. :/ Thanks for writing! So glad that you found this post, Ruth Ann. It's one that I kind of wish that I could make mandatory reading for all of my blog readers. :) And yes, your husband is a wise man. If you have food intolerances that most definitely makes it a lot harder to cut expenses! I know if we ever would need a special diet of any kind that it would increase our budget pretty significantly. And I hear you on the enjoying the challenge (most of the time). There are days that I'm pumped about figuring out how to make it all work....and then there are the days that like you, I'm just sick of trying to figure out how to stretch those pennies! Keep doing your best....and enjoy the success of cutting your budget by $100 last month. That's worth celebrating! I don't often meet someone as frugal and tight as I am, but I think u might be a soul sister in that department!! I love reading ur blog. Ive done a 200.00 budget for a long time but I have loosened up a bit cause it's hard to be able to have company and make plenty of food for others and stick to it. Hey, frugal soul sister! So glad to meet you! And I'd love for you to chime in here more with your tips and tricks, cause I'm sure you plenty and we could all benefit from the things you've learned. And yeah, we've had a $225/mo. budget for a year or two now and may actually bump it up to $250 later this year depending how difficult it is to stick to $225. Part of what's hurting it right now for me is the cost of eggs (around $2/doz.) and milk (close to $4) in this area. We have somewhat high prices on other stuff too but those two staples are things that I can't totally do without, you know?